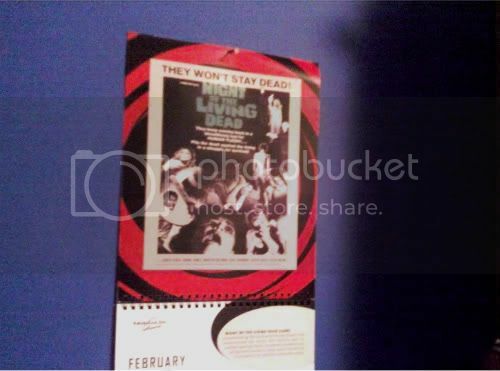 My questionable horror film a month wall calendar commanded me to. I don't go against a sign that strong. It's why I relaunched the feature with The Brain that Wouldn't Die. George A. Romero turned 70 years old two days ago (4 Feb) and I thought it would be a fitting tribute to the godfather of zombie cinema. The man's still kicking out ...of the Dead films like they're going out of style. Well, technically they are. What with the influx of fast zombies with superpowers and the ability to learn, use logic, and love. It's a wonderful zombie (technically living dead, but the terms have practically become interchangeable) film. I think that's the key here. It's not just fanboy praise: it's solid filmmaking. Night of the Living Dead is the unassuming brainchild of writer/director George A. Romero and writer John A. Russo. It sets the standard for all future living dead films. Take a ragtag group of strangers from a community, lock them up into a questionably safe locations, and watch them struggle to survive each other and the unending assault of the living dead. While Romero would certainly add social, economic, and political subtext to his later films (he loves riffing on consumerism, hence Dawn of the Dead in a shopping mall and Land of the Dead with its towering wealthy shopping oasis), Night of the Living Dead is all about interactions in the face of a disaster. The zombies are great. That's hard to question. The character development through choices made in a chaotic situation is far greater. From the initial "They're coming to get you Barbara" to the family in the basement banding together against living and undead intruders, how the characters choose to deal with each other is the key to the film's success. Yes, meaning was created with the casting of Duane Jones as Ben, the leader of the survivors. No, Romero did not set out to create a film exposing the dangers of unquestioning racism. He's said many times that he cast Duane Jones because he was the best actor for the part regardless of the color of his skin. Jones knew when he was cast the film would be seen in a different light, and Romero and Russo realized that soon enough. Through a stupid loophole in copyright law that destroyed many films in this time period, the creators lost the rights to the film by omission of the (c) symbol in the final theatrical version. This means that anyone can use and manipulate the material however they want. There are rereleases with five seconds of new footage where the profit goes to the new "creators." There are unlicensed remakes, colorized editions, and redubbed recordings constantly shooting out at consumers. It's a risk to pick out any edition. Some are cropped, cut, edited, rerecorded, reorganized, or digitally manipulated without warning. Others are so low quality you can't tell what's happening on the screen. I've yet to find an edition with subtitles, probably because the economic appeal of the film for companies is a free film with a built in audience. I've embedded the cleanest copy I could find online below. Of course, I feel any film fan should have a watchable copy in their DVD collection, though not everyone would agree. There's another version with higher quality and many downloadable formats at the Internet Archive that's a bit too large and unwieldy to embed here.